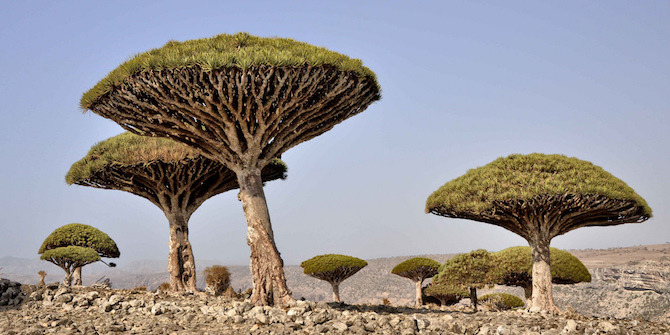 Once upon a time, people believed that Socotra was the garden of Eden. Beyond the legends, Yemen’s civil war has definitively changed the reality of this quiet island, protected by Unesco for its biodiversity. Although there are neither Houthis nor jihadists there, Socotra (with about 60,000 inhabitants) has been experiencing increasing geopolitical pressure and an unprecedented military build-up. On the island, the balance between nature and humans risks being irremediably altered by planned constructions, mass tourism and emerging networks of patronage. From 18 May 2018, the United Arab Emirates (UAE) started withdrawing soldiers and military vehicles from Socotra, in compliance with a Saudi-brokered agreement with locals and Yemen’s recognised government. Emirati forces had been deployed a few weeks before without prior consultation with the Yemeni government, seizing control of the port and the airport. Today, Saudi Arabian soldiers are de facto replacing the Emiratis ‘to train Yemeni security forces’ in Socotra, with Riyadh also announcing its own development plan for the island. Contrary to public statements, this controversial story is not completely patched up and it is likely to influence the future of Saudi–Emirati relations in Yemen, especially in the areas of the south the Houthis have been driven from. Emirati involvement in Socotra has grown since 2015, when it was partially damaged by two cyclones: a third cyclone hit the island on May 2018. Abu Dhabi was the quickest to begin donations to start reconstruction back in 2015, also providing basic goods and electricity to one of the most marginalised areas of Yemen. But ‘emergency aid’ turned into ‘development aid’ and then into what appeared, also in the eyes of many locals, to be the increasing Emirati colonisation of Socotra. ‘We should have communicated more’, said the Emirati Minister of Foreign Affairs Anwar Gargash, denying any strategic purposes behind the UAE’s humanitarian aid. Secondly, the Socotra issue has created further friction within the Saudi-led Coalition, which has intervened in Yemen against the Houthis since March 2015. As a matter of fact, the Saudis and the Emiratis were already pursuing parallel strategies in the south, as demonstrated by recent clashes in Aden. Abu Dhabi’s informal support for the pro-secessionist Southern Transitional Council (STC), coupled with the flourishing of Emirati-backed militias on a regional basis, are fuelling separatist spirits in many of southern Yemen’s regions and reportedly in Socotra, challenging the original Saudi plan of a unified Yemeni state. Thirdly, the local impact of the ‘Socotra crisis’ should not be underestimated. Socotris have experienced an unprecedented tide of politicisation mostly due to the nascent networks of patronage built by the Emiratis: both anti– and pro-UAE demonstrations were held during the climax of the dispute between Abu Dhabi- and Yemeni- recognised institutions. This exposes Socotra’s unique natural and human environment to unpredictable geopolitical interferences, as has already occurred in Mahra, Yemen’s easternmost governorate, where Oman has traditionally been a softly-engaged neighbour: Muscat supports the heir and would-be Sultan of Mahra and Socotra, Shaykh Abdullah bin Issa Al-Afrar. What is happening in Socotra has already been seen in Mahra, another area until recently left relatively unscathed by the civil war. First, the Emiratis increased their humanitarian and military presence in Mahra and then, in response, the Saudis decided to send aid, Salafi preachers and soldiers (in December 2017) to counterbalance the UAE’s geopolitical ambitions. However, the intra-Gulf competition for Socotra has been better-covered in the media as compared to that for Mahra, which is also due to the peculiarity of this Unesco-protected island and the reaction of a segment of the local population. The indirect battle for Socotra confirms that the Emiratis and the Saudis are not always on the same page: they are allies against the Houthis (fighting alongside each other on the Red Sea front), but are clear competitors for Yemen’s present and future regional balances. And with an eye on Socotra, they are advancing assertive geopolitical strategies in the Western Indian Ocean. Eleonora Ardemagni is Associate Research Fellow at the Italian Institute for International Political Studies (ISPI), Gulf and Eastern Mediterranean Analyst for the NATO Defense College Foundation and the Aspen Institute Italy. Among her latest publications on Yemen and the Gulf monarchies is ‘Gulf Powers: Maritime Rivalry in the Western Indian Ocean’, (ISPI Analysis, April 2018).